Dr. Franklin is so wonderfull verry attentive. Always there if you need him. He takes time out at a very busyscedual to call you back no matter what. Dr. Franklin is so wonderfull verry attentive. Always there if you need him. He takes time out at a very busy scedual to call you back no matter what. 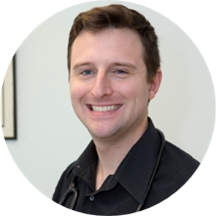 Franklin DeDominicis is a graduate of Hofstra University and board certified as a Physician Assistant by the NCCPA. He earned his Bachelor’s of Science in Biology at Marist College, Poughkeepsie NY. He joined Internal Medicine of Greater New Haven in 2017. It was great, highly recommended. Franklin is very easy to talk to listens to my concerns. Professional and knowledgable.